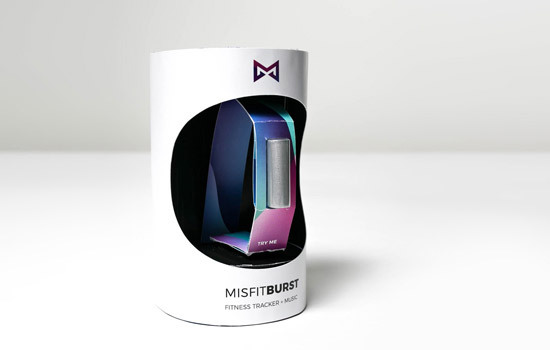 The Misfit Burst took first place in the national Paperboard Packaging Alliance student design challenge. This past academic year, student teams from CAST and CIAS won national awards for the innovative packaging designs for fitness trackers. Four of eight student design teams from Rochester Institute of Technology that were entered in the national Paperboard Packaging Alliance competition were awarded top placements for excellence in design. The teams were part of the alliance’s annual student design challenge and recognized recently at Pack Expo International, one of the largest trade shows for the packaging industry held in Las Vegas, Sept. 25-27. More than 60 entries from 13 collegiate teams were in the competition. Student teams were asked to design an interactive package for a fitness tracker that allows customers to try the product on before purchase and re-use it afterward to store the device. Over the past academic year, the students from the packaging science program in RIT’s College of Applied Science and Technology worked closely with students from graphic design and industrial design, both part of the RIT’s College of Imaging Arts and Sciences, as part of a multi-disciplinary course, Packaging Design. Fitness trackers are popular health monitoring systems, and companies are trying to reach further into the millennial market with moderately priced devices. Could packaging help attract this new market? That was one of the questions posed to student-designers as part of this year’s design competition. All entries included a prototype design, market research, cost estimates, packaging materials assessment and sustainability information as well as information about how materials and designs were selected. It also had to be within a set price range of $45-70, to target college-age buyers. Over the course of a semester, eight groups worked together on teams that resemble those found in the workplace. Coursework, and the challenge, provide the students with hands-on skills in project management, marketing and incorporating sustainable designs in product development. The collaboration between CAST and the College of Imaging Arts and Sciences over the past several years provides students with an opportunity to understand how designers and packaging professionals work together to influence a company’s brand and bottom line. “For me, this was an amazing experience. Our teams both did a fantastic job of presenting their concepts to the audience at the luncheon,” said Lorrie Frear, professor of graphic design in RIT’s College of Imaging Arts and Sciences. She and Wynkoop co-teach the course. All eight teams entered designs, and winners presented their concepts at the awards luncheon held at Pack Expo. Design challenge competitors represented 13 colleges and universities including RIT, the Fashion Institute of Technology and San Jose State, Indiana State and Clemson Universities. RIT has participated and had top placements in the competition for more than 10 years. Winning student teams and their academic programs receive monetary awards: First place: $5,500 to the team/$5,000 to the school; second place: $3,300 to the team/$3,000 to the school; third place: $1,650 to the team/$1,500 to the school.